Our beloved country was dedicated to Mary Immaculate in 1846. That is to say that the Holy Ghost, through th e voice of the American Bishops united in Council at Baltimore, gave to this nation the Mother of God as its principal Patron. In times of crisis, a mother rushes to her off- spring. A mother bird appears on the scene when her nest is approached. A mother beast defends her young with life itself. A human mother darts into a burning home to save her child. So Mary, Mother of mankind, will protect those who have recourse to Her through Her favorite prayer, the Rosary. Mary is stronger than on army in battle, because Jesus, Lord of hosts, refuses His Mother nothing. When the tyrant Herod sought the life of the Divine Infant, Mary took the God of nations into her protecting arms, and fled with Him into Egypt. She is divinely chosen likewise, to protect those nations which recommend themselves to the Lord. Mary’s title “Queen of Peace” is a reward for service rendered in war. When the greatest battle in history was being waged on the rock of Calvary, the powers of darkness seemed to triumph, devils joined forces with brutal soldiers, but Mary, valiant woman, stood her ground. Jesus, our Commander-in-Chief, was fighting to the death. Mary, selfless Mother, did not ask Him to surrender. She bade Him win. She encouraged Him on to victory. She too was marked with the wounds of bottle. Her motherly heart was pierced with a sword of sorrow, but she emerged victorious, Queen of Martyrs, Queen of Peace. It is Mary’s will to bring us peace, with Jesus. Jesus came into the world through Mary. The hearts of men must first be converted to charity and justice by a crusade of prayer and penance. 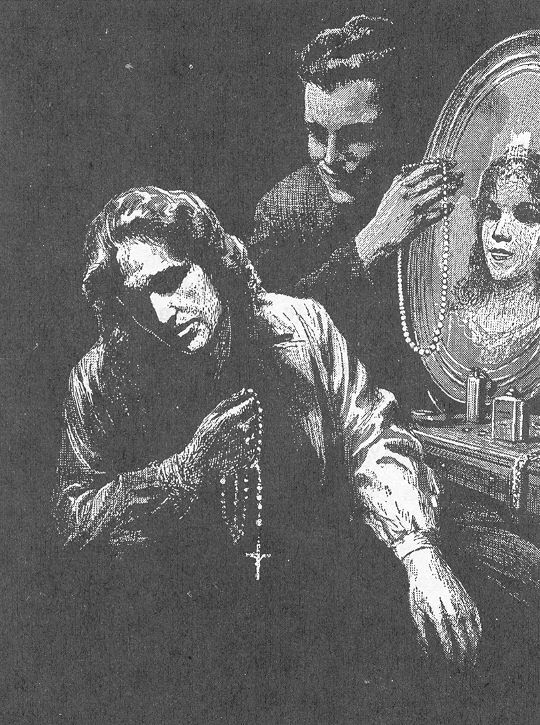 That is the purpose of a Rosary Crusade to Mary. “When we have once found Mary and by Mary Jesus, and by Jesus God the Father, we have found all good things,” says Blessed De Montfort. A Rosary Crusade will bring spiritual victory to our stricken world, if Mary’s orders are obeyed. 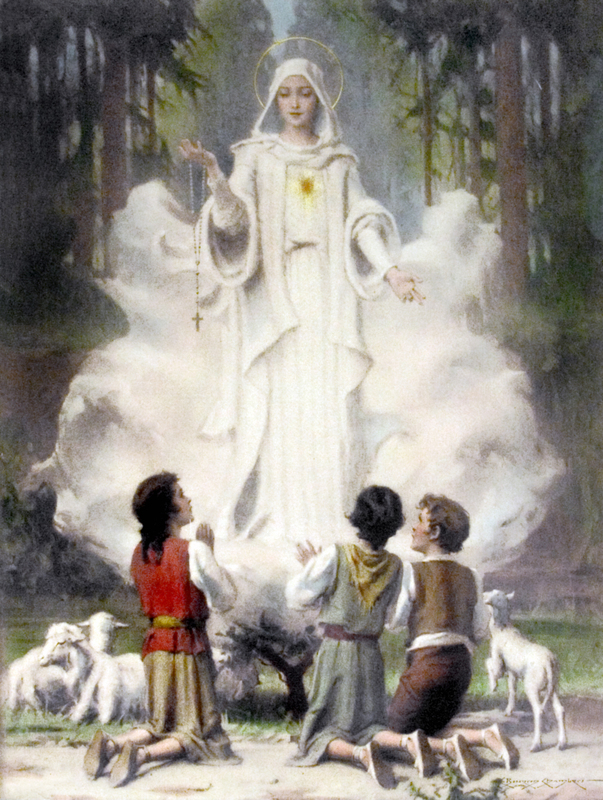 Those orders were given in the year 1917 when our heavenly general at Fatima repeatedly bade the shepherd children to say the Rosary, to preach a crusade by word and example, in order to procure blessings for the world. She assured them that she would obtain peace and the conversion of sinners, if men would heed the lessons of the Rosary. The Rosary will foster religion, humility, and personal purity in these days, when weak souls lose faith in God at the sight of the misery of nations and horrors of war, abandoning themselves to unbelief and immorality as a means of escape or as a consequence of evil example. The Rosary is a map of life, a social pattern, a complete Christian theology, capable of inspiring faith, hope and confidence as a heavenly antidote for the moral confusion and doubt which reign in the minds and hearts of so many modern men and women. It will substitute in hearts the love of God for love of the world. The word “rosary” derives from the Latin word “rosarium” meaning a garden of roses, and was used as far back as the thirteenth century. Pray that these fair gardens may sanctify every Catholic home in these difficult modern days. The Rosary, containing I one hundred and fifty Hail Marys, is sometimes called the Psalter of Mary, in imitation of the one hundred and fifty Psalms of David contained in the Bible. The Psalter of David is used by the priest in the breviary, whence the Rosary is called the People’s Breviary. It is also referred to as the People’s Bible, because its fifteen mysteries unfold to the world God’s most sublime revelation-the life of His only- begotten Son.